Telbru recently joined the Twitter sphere (@Telbru) and I hope this is part of them getting their act together and telling the customers what’s going on. I believe anybody living in Brunei knows how much people dislike the e-Speed (and now the Zoom!) experience. Complaints of slow speeds and connectivity issues are always heard every few days it seems. Sometimes Telbru will respond and other times not, but honestly they need to be more transparent in what they are doing. The same goes for all their other services; as goes with my Speed on Demand findings, there often is no official word on what is happening. Maybe it’s just me but having a problem and not being told what is being done really annoys me. If you tell me what is being done or even if you tell me why it can’t be done, I will be more understanding. Just say something and treat your customer right by give them information they deserve. You can tell us that you are doing nothing but only if you have valid reasons (not excuses). Reach out and communicate with your customers. As mentioned before they recently started with Twitter (@Telbru) and slightly with Facebook (Telbru 4 U). 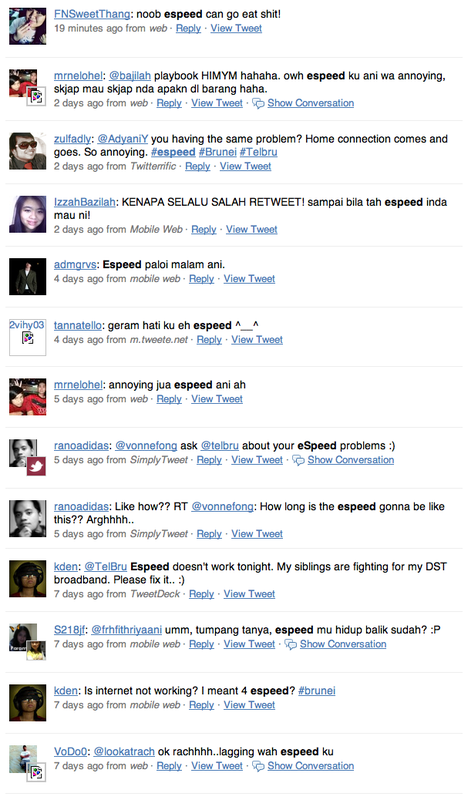 I initially thought the eSpeed forum would have been a place for Telbru to communicate with their customers but alas it is not – no updates since June 2008. After some probing Telbru told me that they are rolling out the upgrades to different sections at a time and people will get them in due time. This information needs to be stated somewhere online from their official source. Just advertising that they have upgraded when in fact people have still yet to get an upgrade will just lead to further discontentment among those who did not get the upgrade: leading to them complaining about eSpeed being a joke in this case. The official word is that they are not blocking bittorrent but users are still complaining of it not being to download properly. Initially I torrented an Ubuntu 9.04 ISO a few weeks back and it seemed to have no connections so I left it overnight and in the morning it managed to finish downloading but my total upload was 0. I suspect that somewhere in the early morning they unblock torrents when the traffic is low and continue blocking it in the morning. There has to be a reason for the upload to be 0 because previously it was fine. More recently I torrented Ubuntu 10.04 and it managed to fully download via torrent and it did manage to upload, however it did take 30 minutes to actually connect to peers and start downloading. On a related note of discontentment with Telbru, their SpeedOnDemand service (logon page available only to newer networks) which has been advertised in October last year and recently in March this year, is still not available for all users, only those on the newer network. There is still no product service page on the eSpeed website and the only information I have on SpeedOnDemand is from what I gathered from asking them questions and I have documented in my posts here and here. It seems to be that with the upgrade advert and the SpeedOnDemand service it seems that they are trying to grab people’s attention by introducing something new hoping to get the public’s support. Which they will initially get. But once customers try it out and find out that they can’t access it, they will get more frustrated with Telbru. Honestly Telbru I give you kudos to setting up your twitter account and actively trying to get into contact with people having issues with eSpeed but you need to do more to get the public faith back. I’m sure the public perception of Telbru from the constant eSpeed and Zoom! complaints isn’t that great. I myself didn’t have much faith in Telbru with my on eSpeed issues – traffic bottleneck causing difficulty in surfing at home with lots of timeouts despite constant connectivity and having to renew IP every day after returning from work. I am happy after switching to the new Alcatel modem from the old Huawei modem which resulted in a constant and consistent connection with the combination of the eSpeed upgrade. In order to improve I suggest that that Telbru give press releases or official information documenting what they are doing and to stop with any of the advertising that gives false hope to or misleads customers. Let us know and be transparent of the repair works or roll out works that are currently underway or are planned and the estimated time of completion. If anybody is like me, knowing what is happening will allow me to be more tolerable of any issues rather than being kept in the dark. I suggest they continue with something like their eSpeed forum giving FAQs, possible solutions as well as updates on their works. Telbru I wish you the best and hope you do this right. I agree… They should tell us (customers) what is going on with them. We are paying them on a monthly basis. I know that before, e-speed was very slow in my house, but recently, after juz one telephone call and after few tweet posts (@telbru), and spending $120 for a contractor to come to my house to do proper wiring, my e-speed is working at the promise of 1 Mbps… (and that is from my wireless router, not directly from the modem). I just downloaded a 32.3 MB file for less than 4 minutes, with the average of 125 kbps… That, I haven’t experience before in my house.. I just hope this speed is consistent for the rest of the year (or as long as I am still an e-speed subscriber)…. Go to your modem menu(192.168.1.1 etc), find the DSL port/line mode and enable only G.dmt and G.lite. It rarely disconnects(only when heavy thunderstorm) so your line rates always stay the same. ADSL2/ADSL2+ is a bit faster but not stable. When it reconnects, sometimes it goes to a lower line rates and you not knowingly experience slowness/lagg. 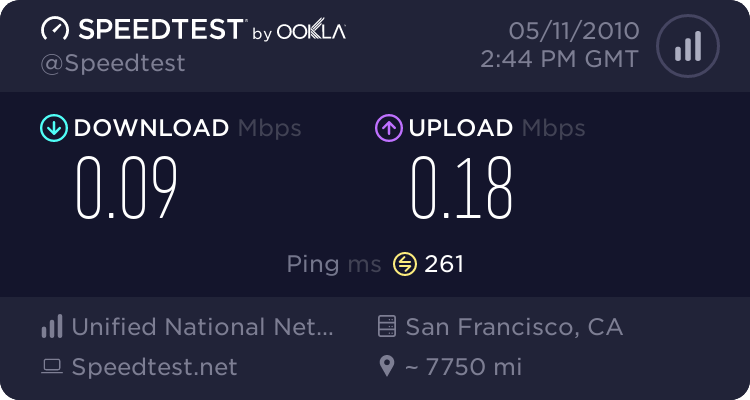 Anyone tried speedtest.net from different servers? My download speed is pathetic. Web downloads are around 10kb/s avg. 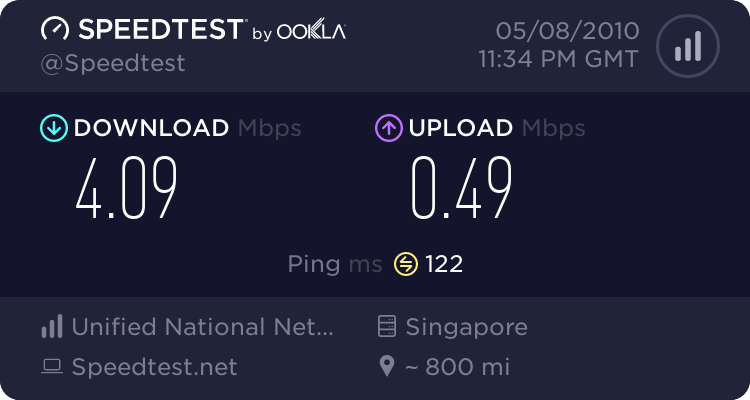 Weird thing is using local bandwidth test my speed reaches to 1Mbps. Anyone have the same problem? There are quite a few possibilities. I believe that there is a bottle neck for our traffic going out of Brunei thus why you get lower speeds. Perhaps the lines connecting Brunei to the external world does not have the capacity to give a full connection speed. Currently my line has been upgraded and very consistent, so personally I can’t complain but I was in the same situation as yours for many months and Telbru really needs to tell us what they are doing to fix things. Tested based on 1 computer with no downloading activity and found HIGH latency with LOW speed..
What is going on to Telbru??? I guess I am lucky??? TelBru is really fooling on us customers.. 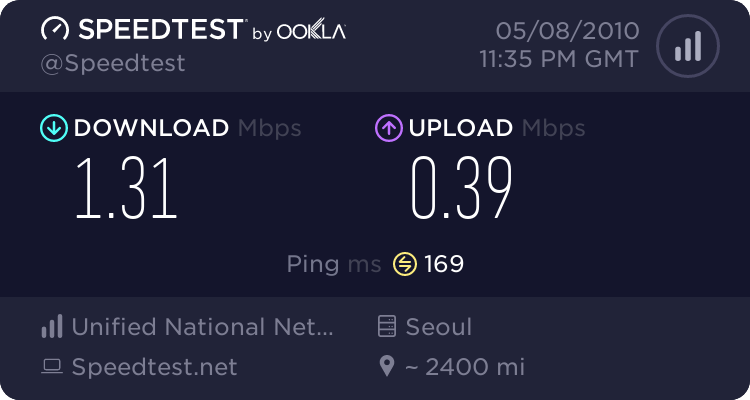 Yes, that’s right, it works for me for the last few week and the speed reach 50KB, sometime 100KB in the midnight but my subscription is at 2.5mbps. At first, i thought as long as the torrent run and reasonable speed, hence i stopped complaint. but then, i am no better than other since two days ago, my speed go down back to 20kb and sometime 5kb. What is telbru really doing? this upgrading process is really messed up the whole system? PROBLEM: REALISED HIGH LATENCY & LOW DOWNLOAD SPEED ON SOME SERVERS. @patrick, o.O how do u chat with those engineer?? Im a bit curious about those cables. Are they using ethernet or fibre optic cable on their main server?? …chances are most users will experience slow connection speed during re-cable. Their servers r always in a mess. There have been comments in other tech blogs/forums calling on telco providers to upgrade their systems and hardware to deal with p2p traffic instead of trying to limit bandwidth or block service as p2p is deem to be the future of file transfers, one example is Steam service. And also a lot of streaming services such as Hulu, pps, etc. Since Telbru is upgrading their system, I do suggest they put that in mind since for a forseeable future, more and more users will be using p2p technology. I myself have hardly downloaded a file more than 10M using direct download. Anything larger must be p2p for me. *Note: Legality and copyright issues aside, there are legal services that offer legal torrents, but telco shouldn’t be the regulators of that law. I just called up this afternoon and they said they are still repairing the cables, and they did received a lots of complains regarding the p2p issues, but they just can’t tell when will the full repairing work take.. Since there is no new complain added, let me tell one of my own..
My speed nowadays are quite good due to the upgrade but the problem is that disconnection happened almost uncountable everyday.. Sometime it can be solve by restarting.. But mostly with just waiting for hours and even days when they change my ip..